Andy Street, Mayor of the West Midlands, today praised the commitment of the Builders’ Merchants Federation for encouraging more young people to join the building materials industry. During a visit to the BMF’s headquarters, the Mayor met with apprentices and discussed the career prospects for young people in the sector, which is valued at £56bn, directly provides 330,000 jobs (which is more than the automotive and aerospace manufacturing industries combined) working across 23,000 companies in the UK and has experienced high levels of growth over the past year. Data produced by the BMF Regional Sales Indicator show that December – February 2018 sales in the West Midlands were 14.3% higher than the previous year. Also, sales for the 12 months to February 2018 were 4.4% higher across the region than 2017. Builders’ merchants supply construction materials, such as bricks and timber, to businesses as well as the general public. The BMF claims that, despite Brexit, their members expect robust sales to continue and that this makes the building materials industry an ideal place for young people to build a career. The Mayor congratulated the BMF for establishing their own Apprenticeships Training Agency, which works to increase the number of school and college leavers considering a career in merchanting. He said, “I’m delighted that work the BMF is doing to attract young people in the West Midlands to take up apprenticeships in the building materials industry. Regionally we have ambitious plans to grow, so we’ll need our materials supply chain to be performing at its best. This presents great opportunities for young people to start a career in an exciting and growing industry”. The Mayor met with John Newcomb, Chief Executive of the BMF, who welcomed the Mayor’s support for the industry. Builders’ merchants are delivering the building blocks for growth in all parts of the West Midlands. We’re delighted by the Mayor’s vision for boosting the economic development of the region, and this presents many new employment opportunities within the builders merchants industry. Our members are committed to supporting the training and development of staff, and we are partnered with universities in Birmingham and Coventry to further develop young merchants skills and to make the most of the technological changes that will shape our industry over the coming years. “We are grateful to the Mayor for his backing of our merchants apprenticeship scheme. We urge any school or college leaver to look into joining our industry. 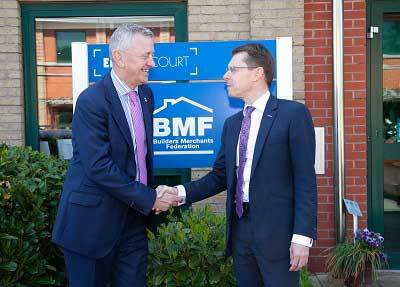 The visit from Mayor Street also marked the 5th anniversary of the BMF moving from London to Coventry. John Newcomb said, “We’re proud to be based in the West Midlands and are ambitious for the area in the years ahead”.